What, bond fund exit fees!!!!!!! Anybody think that would cause a run for the exits? It would seem to us that a change in the documentation regarding redemptions on mutual funds would not be legal unless you allowed those who invested prior to that change, a chance to exit the fund. Think about the rush for the exits….. Not a well thought out plan. As interest rates rise, if they ever do, there will be a flow for the exits as a natural event. Most fund managers are aware of this. Penalty exit fees will cause people to withdraw from the funds before the fees take effect and that could cause a rush out of the fund. Investors can and should look into owning the individual bond rather than a mutual fund of bonds. Yes they can be illiquid but if you are purchasing government securities, they are not at all illiquid and are easily purchased. Municipal bonds take a little more work but once done they too are easily purchased and sold. Perhaps junk bonds, which we do not recommend, can be difficult to sell but we have no experience with those instruments. We have been trading muni bonds for more than thirty years and to date have never had a problem selling them. The US appears to be running a multi-state orphanage for children who cross our borders illegally. Why are parents sending their children to the USA? Because they believe that the USA will keep them here, give them amnesty, a free education, healthcare and homes. They also believe that they will then have entry into the US as the parent of the child who was given amnesty. Information abounds in Central America that the USA will accept these children and that those sending the children will be able to join their children eventually. We have no right to keep other people’s children without parental agreement and should return them to their parents. As to the rumors, we are sure that the US knows how to communicate the truth. Now we are not only the world’s police but also will shortly have the title of the world’s orphanage, nice and all on the tax-payer’s dollar, that is for those of us who have to pay taxes. No comment on the masses that pay zero and take from the government without returning a nickel’s worth of service for it. Many are registered voters and vote for representatives that will continue the countrywide handout policy. Kind of makes a tax payer really angry doesn’t it? We hope that the governments elected officials understand that there is a growing discontent in the middle earner group, people who pay their taxes and can barely afford to pay their bills while others who pay no taxes are beneficiaries of free food, housing, phones and healthcare while working for cash. Something has to be done to level the playing field. Time for a real VAT-TAX to equalize the field. 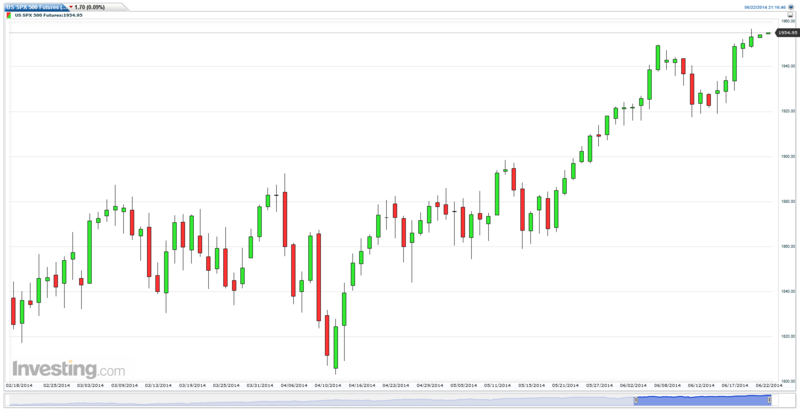 On Friday, a quadruple witch event, the September S&P 500 futures contract printed another all-time high of 1956.75. This high was printed with respectable average volume but less volume than had been seen in the two previous sessions. We might have expected to see an increase in volume with the new high, but we did not. All the indicators we follow are pointing higher at overbought levels. We did see a brief dip, as measured by the indicators, out of the oversold area on June 12th but it didn’t last very long and the market returned to the overbought status which has been the trend since May. Looking at the monthly charts the rally in the gold chart peaking in August of 2011 and the current rally in the S&P 500 chart look astoundingly similar. Just saying! We are above the Ichimoku Clouds for all time-frames. The 5-period exponential moving average is 1945.39. The top of the Bollinger Band is 1960.32 and the bottom edge is seen at 1892.95. We have a number of horizontal lines which mark areas where support should be found. The first is 1944, should that fail we expect to see 1918 to be the next level of support. Under that level there should be support at 1908-1906 and then under the uptrend line at 1889.75. The uptrend line for Monday is at 1899.16. The daily 1% by 3-box point and figure chart continues to look very positive. The upside target on this chart is 2278.81. The 60 minute 0.1% by 3-box chart continues to look positive but it should be noted that there is some congestion in area surrounding 1926. 27.8% of the Friday volume was seen at 1953. We continue to advise to keep stops tight. The market will continue to try to forge higher but as we enter the summer doldrums and the bearish August September season expect to see bumps along the bullish road with several pot-holes ahead, why there might even be a sink-hole in our future. That said, stay cautious and watchful. We do have inflows of cash into the US and the Canadian markets from the globe. Our interest rates are higher than most and offer more safety than other competing rates. The NASDAQ 100 seems to be in a trading range of 3806.50 to 3750.25. This index is less overbought than its big brother the S&P 500 is. We continue to see up arrows from all the indicators that we follow herein. The 5-period exponential moving average is 3786.66. The top of the Bollinger Band is 3825.82 and the lower edge is seen at 3688.47. We are above the Ichimoku Clouds for all time-frames. The uptrend line is 3686.60. The big volume area for the NASDAQ 100 for the Friday session is at 3792.50 where 19.1% of the day’s volume traded. Friday’s session was an inside day. The daily 0.8% by 3-box chart has an upside target of 4035.29. This is an extremely positive chart. The 0.1% by 3-box 60 minute chart has an upside target of 3892.74 and there is an internal downside trendline on this chart. A very short-term uptrend line is seen at 3686.60 and a short downtrend line is at 3800.10. So long as we do not close above 3795.00 we will remain in the trading range, that said, a close above 3795 for two days will signal a new upward leg. As usual, keep stops tight and fasten your seat-belt. The Russell 2000 rallied 4.60 in the Friday trading session. We are trading inside a very steep up trending channel of 1149.30 and 1201.30. We are above the 5-period exponential moving average of 1175.09 which remains a positive. The upper edge of the Bollinger Band is 1191.86 and the lower edge is seen at 1109.45. We have a line in the sand at 1149.30 and 1147.20. Should we close below that level for two days, it would have very negative implications. There should be resistance at 1183.70 and at 1185.60. We are above the Ichimoku Clouds for all time-frames. It seems that the risk off trade is the trade of the day and this index is the beneficiary of those dollars. All the indicators that we follow herein continue to point higher albeit at overbought levels. Our own indicator is curling over and could, during the next session, issue a sell signal. This index will out-perform to the upside with the risk off trade and outperform to the downside with the risk on trade. Take note of the volatility of this index and trade accordingly. The US Dollar index managed to stay above the uptrend line in the Friday session. Currently the US Dollar index is trading inside a downward sloping channel with its upper level at 80.718 and its lower line at 80.219. The uptrend line drawn from May is at 80.252. Our line in the sand is at 80.025. The 5-period exponential moving average is 80.496, a level that we are below. This has negative implications for the dollar. The top of the Bollinger Band is 80.936 and the lower edge is seen at 80.313. Both the stochastic indicator and our own indicator continue to issue a sell-signal. The RSI has flattened and is at 42.53. We are above the Ichimoku Clouds for the daily time-frame but are below the clouds for both the weekly and the monthly time-frames. The weekly chart shows that we have been in a trading range since September. The 60 minute 0.1% by 3-box chart has a downside target of 78.87 and an older upside target of 83.078. The daily 0.5% by 3-box chart looks worse than the 60 minute chart and shows us that 78.97 has been tested six times and has held, well so far it has. We are getting mixed signals and would advise caution for both bulls and bears. It should also be noted that the Bollinger Bands are becoming more narrow telling us that we should expect an expansion in volatility fairly soon. Crude oil rallied 0.55% in the Friday session closing up 59 cents on the day. The 5-period exponential moving average is 106.06. The top of the Bollinger Band is 107.42 and the lower edge is seen at 100.60. There is no doubt that the rally in crude has benefited from the unrest in the Middle East. The price of Brent shows just how nervous the markets are about supply disruptions. The spread narrowed a tad in the Friday session with Brent losing 0.33 on the day and WTI gaining on the day. The medium term trendline for crude oil is 100.60. The upward sloping channel lines are 108.43 and 105.27. The stochastic indicator and the RSI continue to point high albeit at overbought levels. The 0.9% by 3-box daily chart has an upside target of 119.64. The chart is positive. The 60 minute 0.2% by 3-box chart has an upside target of 109.21. This chart remains positive. We are above the Ichimoku Clouds for both the daily and the weekly time-frames but remain inside the clouds for the monthly time-frame. Gold squeaked in a slight positive for the Friday session closing at 1314.80. We did close below the opening, which was 1320.30 and therefore left a red candlestick on the chart. The Bollinger Bands are expanding but this market closed above the upper level of 1308.94. It is likely that gold will retreat back inside the Bollinger Band as that band continues to expand. The 5-period exponential moving average is 1297.12. All the indicators that we follow herein continue to point higher although they are overbought. The 0.9% by 3-box daily chart has an upside target of 1470.31 and a downside target of 1113.74. This chart has a very positive look to it. The 60 minute 0.2% by 3-box chart has an upside target of 1367.56 and a very positive look as well. At this time we are positive on gold but we are overbought and would not be surprised to see this market back and fill and return to the congestion area of 1296 or so before the next rally is seen.